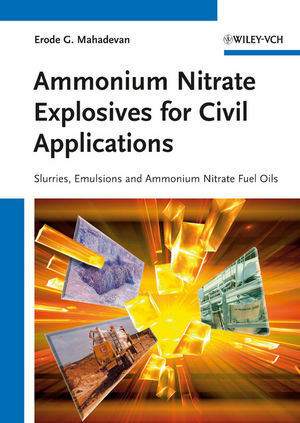 The book describes the science and technology of formulation and manufacturing of non-nitroglycerine explosives with ammonium nitrate as the main ingredient. Based on the author's industry experience of more than thirty years, it provides an unparalleled treatment of one of the commercially most important classes of explosives and therefore stimulates further research and development efforts in the field of explosives for civil applications. Erode Mahadevan is currently a Technology Consultant based in India. Before that for more than thirty years he was engaged in the field of commercial explosives and accessories and specialty chemicals. He has worked with many multinational companies such as ICI (UK), BASF (Germany), Atlas Chemicals (USA), Dow Chemical (USA), Nitro Nobel (Sweden), Dyno Industries (Norway). For twenty years Erode Mahadevan was Managing Director of IDL Industries Ltd., a leading producer of civil explosives based in India. He holds a Masters Degree in Physical Chemistry from the University of Mysore, Bangalore, and a PhD from the Technische Hochschule in Karlsruhe, Germany. Before starting his career in industry, Erode Mahadevan was a postdoctoral researcher at the Department of Chemistry at the Columbia University, New York.